This is a list of common questions on Business Configuration related to the SAP Cloud Applications Studio, that we frequently receive from partners and customers. I have tried to answer them, and will keep adding to this list. I have used a BCO datatype for custom field/extension field, but it shows the code value in the drop down instead of a text box on the UI. Why is it so? Code value comes up in the drop down if the field is defined as an Attribute instead of Description in the BCO. 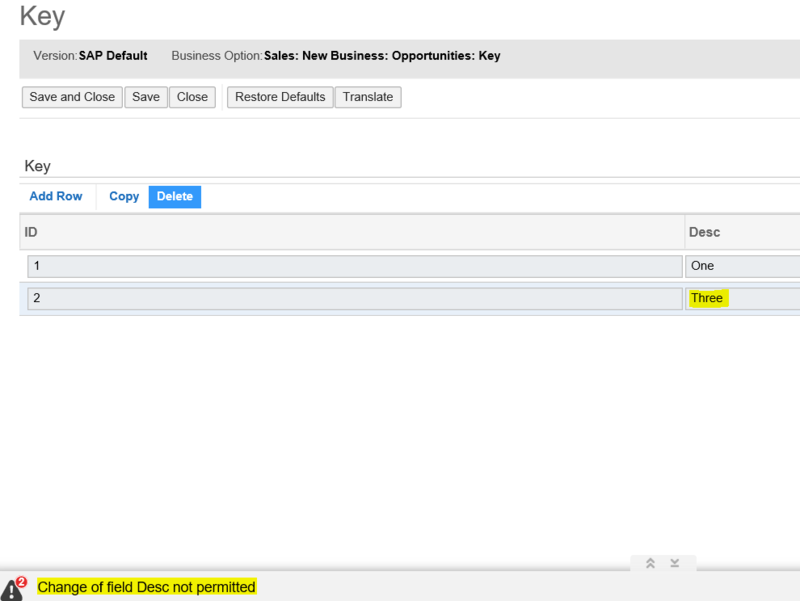 Always create a Description field in BCO if you want to see text in drop downs. What happens when a solution gets disabled? All the scoping decisions and fine-tuning data is lost and the solution is no longer available for scoping. Is it possible to delete or change BC content used by other objects? 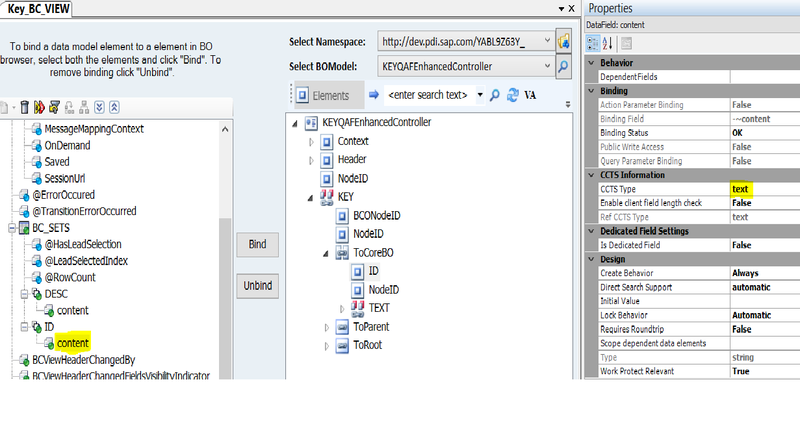 If the BCO is not referenced by another object (BC Set, BCO, BO or XBO), then it is possible to delete the BCO. If the BCO is used by a BC Set, then yes, it is possible to delete it, but you must first clean or delete the BC Set. If the BCO is being used by a BO then deletion is possible only in the first version (not in patch) after removing the BCO’s reference. Why can’t I see the fine-tuning activity? To see custom fine-tuning activity in Project activity list, you must fulfil the following prerequisites:In the BAC file, you have selected the ‘Visible in Scoping’ checkbox. 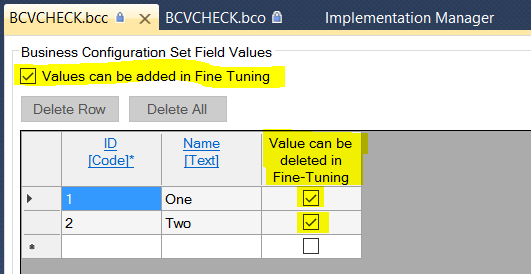 You have marked the BC Sets assigned to Business Option as fine-tuning relevant (Add and delete in fine-tuning). You have already created the BC views. 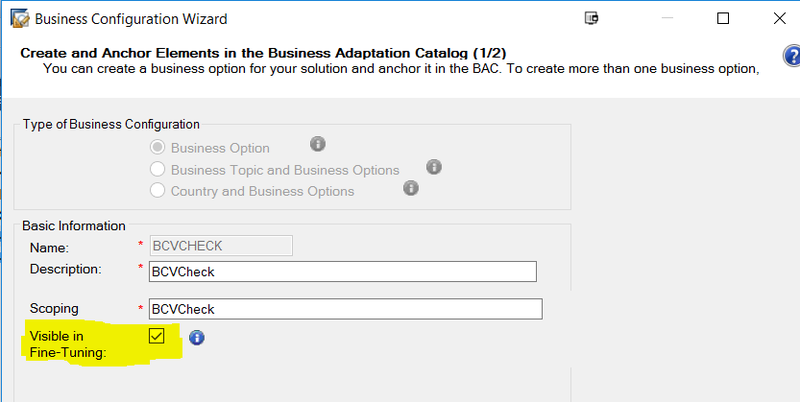 We recommend that you create the BC View in the same version where the BCO was created. Why does the Export Translation on BC Set not export file, and gives the error “No translatable text found”? Translation feature works only when the content has fields of type text/description. Ensure that the BCO on which the BC Set is created has a “Description” field. 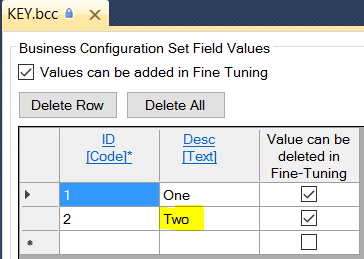 Why do I get the error “Change of field <FieldName> not permitted” on adding an entry on the fine-tuning UI? This error comes up when you delete a delivered BC Set entry on fine-tuning UI and add a new entry with the deleted Key and a new Description. Description for BC Set entries added in SDK cannot be changed on the fine-tuning activity UI. You can, however, delete the entry on the fine-tuning UI. If you want to change the description of the BC Set entry created in the cloud studio, it can be done in cloud studio (even in patch versions). Why does a dropdown show up in fine-tuning UI even though the field was created as a text? This happens when you update the metadata after opening the BC View in UI Designer. Metadata update changes the CCTS type of the BC Set field from “text” to “Code” resulting in the issue. Therefore, you must not update a metadata after opening the BC View in UI Designer. How do I change/edit BCO which already has a BC Set and Fine-Tuning data? So just a naive question , If I dont want to create BCView right now and may be do that later, is it okay? What happens if I dont create BC View but assign my BCO to BAC? If you create BCview later in some other patch for example version 8 and your target system has version 7 deployed. In current development tenant everything work fine, you can see BCview in Finetuning, but after successful deployment of version 8 in target tenant same BCView will not be seen.